The Extragalactic ALFA Zone of Avoidance team is mapping the distribution of low-Galactic-latitude galaxies and large scale structures through detection of galaxies' 21-cm emission with ALFA. This Zone of Avoidance (ZOA) survey finds new HI galaxies which lie hidden behind the Milky Way, and also provides redshifts and other HI parameters for partially-obscured galaxies known at other wavelengths. In this way, we are illuminating the large scale structure in the local Universe in the low-Galactic-latitude sky where it is currently poorly mapped. The ZOA survey is one of the Extragalactic ALFA projects, and proceeds in tandem with Galactic ALFA and Pulsar ALFA projects. This "commensal" style of observing, using multiple backends simultaneously, increases enormously the scientific throughput of the telescope, making very efficient use of observing hours, particularly important during the popular Galactic time. The survey proceeds in two phases: shallow and deep. The observations for the shallow survey (rms ~5-7 mJy) are complete, and were conducted in commensal mode with Galactic ALFA projects, mapping about 1000 square degrees, 30° ≤ l ≤ 75°, |b| ≤ 10°. We have cataloged about 450 galaxies, including previously unrecognized dwarfs (McIntyre et al. 2011). 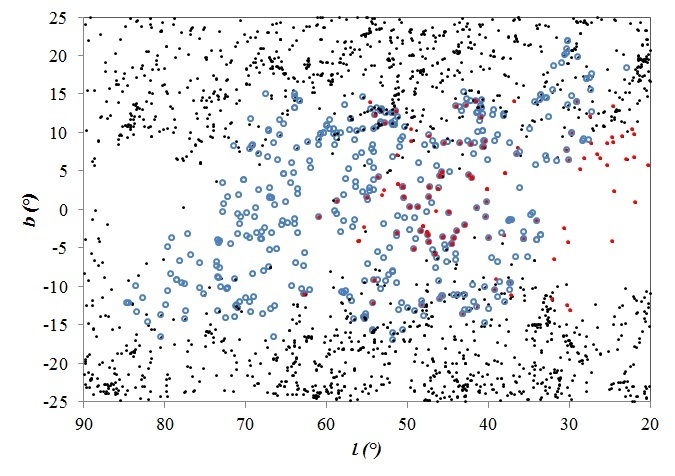 Figure: Galaxies revealed by the ALFA ZOA shallow survey (blue circles) shown with previously-known LEDA galaxies within 12,000 km/s, and galaxies from low-Galactic-latitude Parkes surveys (red points). We are surveying the ZOA in both the inner (30° ≤ l ≤ 75°) and outer (175° ≤ l ≤ 210°) Galaxy, with Pulsar and Galactic Radio Recombination Line commensal partners. The effective integration time for the deep survey is 5 minutes per beam, reaching 1 mJy rms. The higher sensitivity and increased velocity coverage of this deep phase puts us on track to detect about 1500 galaxies over the ZOA, including low HI mass objects in the local universe, and HI galaxies at large distances. Galaxies with recession velocities near 20,000 km/s have been discovered in our first completed field, 15 square degrees centered at l = 192°, b = -2°. Figure: Curves show predicted sensitivity to HI mass for the shallow and deep surveys, assuming 6 σ detection of a galaxy with 200 km/s linewidth. Actual detections to date are overlaid. The deep detections are from a completed 15 square degree field in the outer Galaxy, a small fraction of the total area to be observed. The gap at ~16,000 km/s is due to RFI. We are able to trace large-scale structure to large distances across the plane in this region. The wedge plot shows how our survey continues the mapping of known large-scale sturcutres behind the Milky Way, and discovers new features. Figure: ALFA ZOA Deep Survey detections in a 15 square degree portion of the survey shown in Galactic latitude vs. velocity wedge (blue circles) with 2MRS galaxies (black dots) and structures indicated from surveys above and below the plane (red circles and labels, Erdo&gbreve;du et al. 2006). 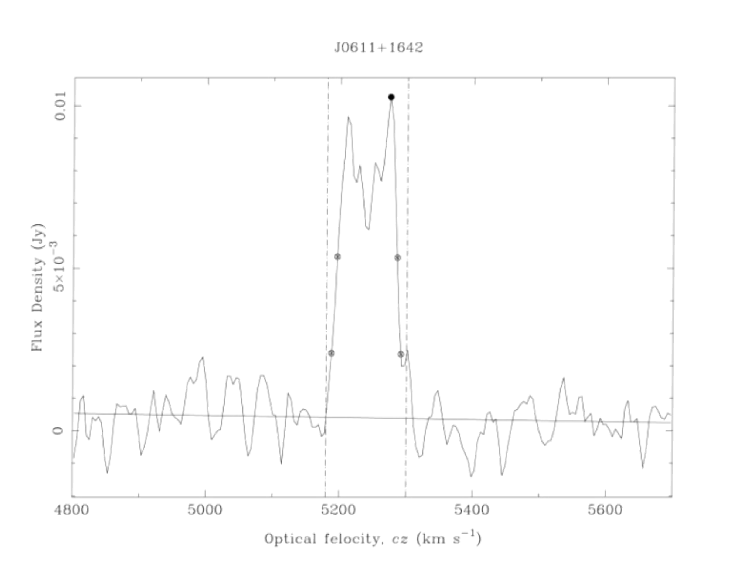 Figure: HI spectrum showing a two-horned profile of one of our HI detections from the Deep survey, and the low noise (1 mJy) flat baselines we achieve. 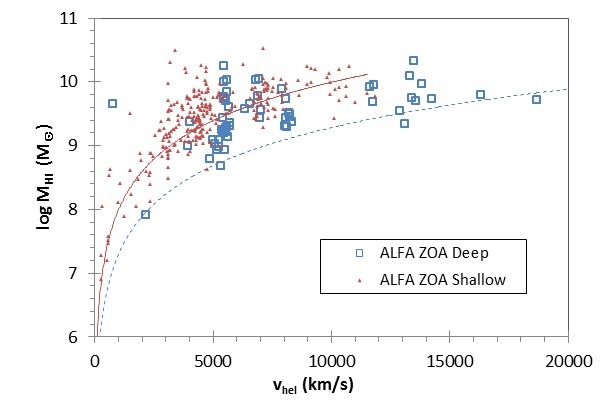 The ALFA ZOA Deep Survey: First Results. McIntyre, T. P., Henning, P. A., Minchin, R. F., Momjian, E., Butcher, Z., 2015, AJ, 150, 28. Discovery and Follow-up of a Nearby Galaxy from the Arecibo Zone of Avoidance Survey. McIntyre, T. P., Minchin, R. F., Henning, P. A., Kaur, A., & Parton, B., 2011, ApJL, 739, 26. The Arecibo L-band Feed Array Zone of Avoidance Survey I: Precursor Observations through the Inner and Outer Galaxy. Henning, P. A., Springob, C. M., Minchin, R. F., Momjian, E., Catinella, B., McIntyre, T., Day, F., Muller, E., Koribalski, B., Rosenberg, J. L., Schneider, S., Staveley-Smith, L., van Driel, W., 2010, AJ, 139, 2130. The Arecibo Zone of Avoidance Survey: First Results. McIntyre, T. P., Minchin, R., & Henning, P., 2012, AAS meeting 210, #410.03 (McIntyre Dissertation Abstract). The ALFA Zone of Avoidance Survey: Results from the Precursor Observations. Springob C. M., Henning, P. A., Catinella, B., Day, F., Minchin, R., Momjian, E., Koribalski, B., Masters, K. L., Muller, E., Pantoja, C., Putman, M., Rosenberg, J. L, Schneider, S., Staveley-Smith, L., 2008, IAU Symp. 244.
van Driel, Wim Paris Obs.